The St. Thomas Aquinas players had no other choice, if they were ever going to get the chance to dogpile. Amidst concerns that a player might get accidentally injured, Raiders manager Troy Cameron made a deal with his team this season. The understanding was that the only way they would be allowed to dogpile this year was if it was following a state championship victory. Saturday evening that long-awaited celebration pile took place, at Hammond Stadium in Fort Myers. With as much fireworks as an Independence Day celebration, St. Thomas Aquinas pounded its way to victory in the 8A title game against the Sarasota Sailors. Clinging to a one-run lead in the sixth, the offense broke things open one last time to put their biggest game of the season headed in the right direction for good. Behind a monster hit from Caleb Roberts deep to right field with the bases loaded in the sixth that plated all three, the Raiders provided the final breathing room they needed for an eventual 8-4 final score. Six outs later they were celebrating together on the field, state championships once again. While the Raiders celebrated, the Sailors were stopped just short of adding their ninth state title. Offense has been a major driving force for the St. Thomas Aquinas Raiders this entire season. In a tight ball game late into the action, the Raiders did what they did all along to get to Saturday’s state championship. Batters worked counts, lined up good pitches and trusted their hands to do the rest. Speedy players focused on getting on base and power hitters worked to drive them in. The Raiders got it going right away in the first inning to take immediate control. Archer provided the first spark with a double to left, and then scored when Andres Antonini smacked a double to center. Caleb Roberts then lined the ball past third base and legged out an RBI double to make it a 2-0 advantage that gave starter Nate Thomas an immediate cushion. Sarasota responded with a run in the bottom of the second to cut the deficit in half. Evan Gibbs legged out an infield single, Jack Duffy was hit by a pitch and Andre James moved the runners up by giving himself up with a sacrifice bunt back to Thomas. Owen Ayers was then also hit by a pitch that loaded up the bases, and a wild pitch allowed Gibbs to come home for Sarasota’s first run of the night. Nate Thomas and then, later, reliever Isaiah Hood both made things tough on the Sarasota hitters. But the top of the order seemed to find the most success, and they worked to set the example to the rest of the lineup. A pair of runs in the top of the third further extended the Raiders’ lead. Archer again got things going when he legged out a high infield chopper for a base hit. Antonini then shot a double into left field, and Fergus followed with another double to left that plated both runners. Roberts nearly connected for another big hit, but Dorso made a great diving catch in center to rob him of a base hit. Another inning brought another run for the Raiders. Riley Rosario reached on an error, Wade Iben singled to center to move Iben into scoring position and Antonini supplied an RBI single to right to make it a 5-1 ball game. With the amount of heart and grit that the Sailors displayed all throughout their playoff run this year, there was no chance they were going down quietly. 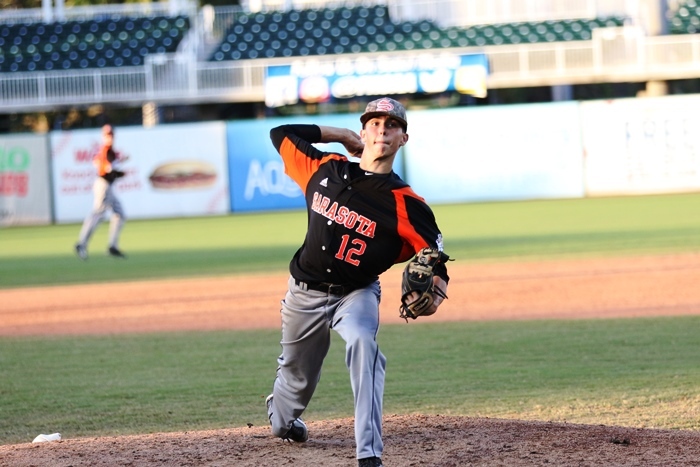 Sarasota rallied for three runs in the bottom of the fifth to pull within a run and keep their title hopes well alive. Just as they had done all along, the top of the Sarasota lineup set the table to get things going in the fifth. Winkelmeyer walked and Ben McCabe was hit by a pitch for a pair of base runners. 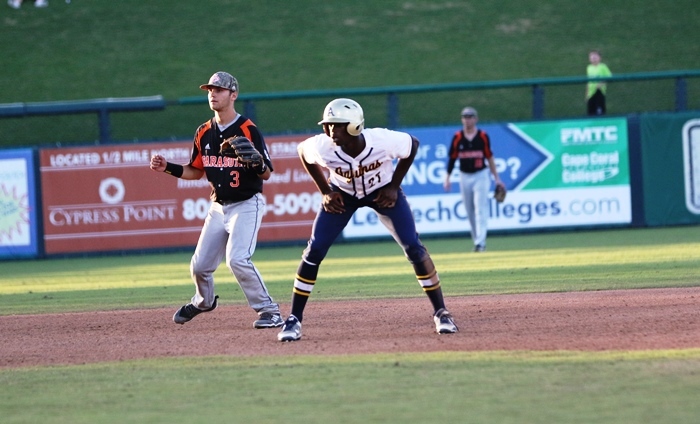 A throwing error allowed Winkelmeyer to score, and Sarasota capitalized on two more errors that resulted in two more runs on the board. The pressure now on with things tightened up, the Raiders provided the final big swings that assured them of victory. Gabriel Terry singled to center to start the top of the sixth, but was then erased on a fielder’s choice that landed Iben on first base. Archer sacrificed himself to advance the runners, Antonini was intentionally walked and Cade Fergus also worked a walk that loaded up the bases for Roberts in the clean-up slot. The senior did what he has done all year for his club, delivering in the clutch with a shot crushed deep to right field to clear the bases with a three-RBI double that notched the final runs of the game.